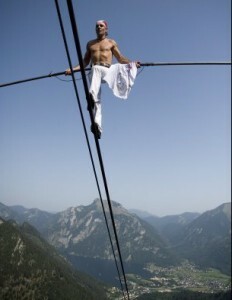 A 46-year-old Swiss stuntman, Freddy Nock, has ascended a nearly 10,000-foot-high mountain by tightrope walking a two-inch-wide cable car wire—without the aid of any safety gear. 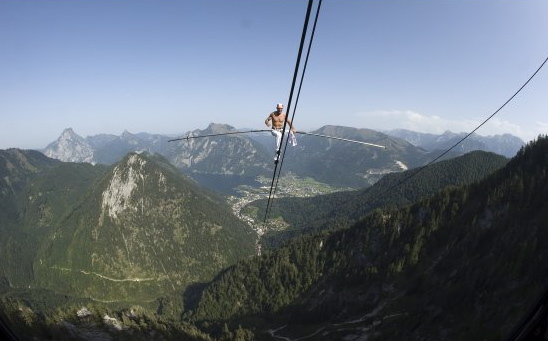 He clambered up the cable to the top of Bavaria’s Zugspitze mountain with only a balancing pole. 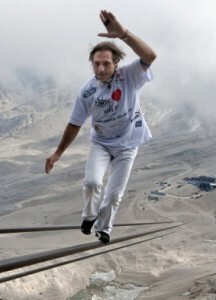 It took the daredevil less than 90 minutes to make the ascent, which is the longest and highest wire-walk in history, the Daily Mail reports. Nock has an even more daring stunt planned for later this month: He’ll ride a bike across a wire in an effort to raise funds for Unicef, reports The Telegraph.